NOTE: This interview with Paul-Michel Bosc, the father, and Paul-Andre Bosc, the son, from Chateau des Charmes winery in St. Davids, orignially ran in Wine Access Magazine. This is a longer, unedited version of the interviews. They are father and son. Paul-Michel Bosc, 75, the mentor, winemaker, viticulturalist and visionary, and son Paul-Andre Bosc, the businessman, the salesman, the student. They have a bond that reaches beyond bloodlines. Their family was exiled from their own country of Algeria during the 1960’s civil war just because they were part of the French minority in a Muslim country. The family was forced to flee to France, then decided to seek calmer political waters and came to Canada, to Quebec, and finally ended up in Niagara. 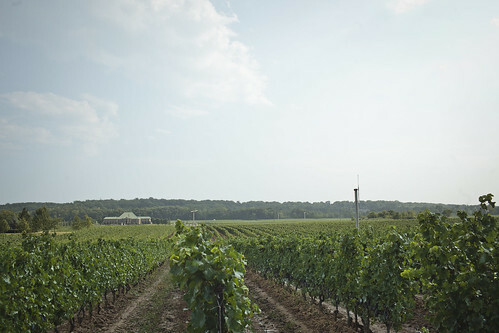 Paul senior, educated in viticulture and oenology, quickly found a job with the Chateau Gai wine company and stayed for 15 years before deciding to go it alone with his son and family and began building Chateau des Charmes. Paul senior was the winemaker, while Paul junior was the businessman. 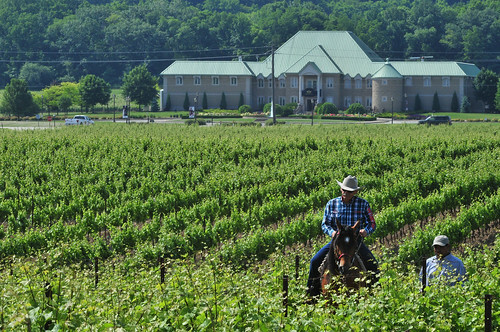 Together, along with Paul-Andre Bosc’s wife, Michele, the marketer, they established and grew Chateau des Charmes as one of Niagara’s most important wineries both historically and today, as Niagara as grown into a world-class wine destination. It was something I was born into. I watched my grandparents work in the vineyards with the grapes. It was something that stayed with me until this day. So I decided to follow in that direction because it was my intent to buy into that property that I loved. So I went to agricultural school where I learned agriculture and viticulture. After that I became the manager of a large co-op in the village where I was born so that was my occupation until we got kicked out of Algeria and we went back to France and then to Canada. I was hired by Chateau Gai wines and worked for them for 15 years as winemaker and then director of research and development. Then I decided to go on my own. So, it wasn’t that I decided to go into the agricultural business. It was something I was born with. My big break was that I quit a very good job to go on my own, let’s put it that way. That would be my big break. At the time people thought the guy was out of his mind, the guy is quitting his job to go out on his own and grow the kind of grapes he wants to grow … (he’ll) be out of business in two years. That was 32 years ago. It takes a country like Canada to allow somebody like me to do what I’ve done. I don’t think going back to France I could have had the impact in one region that I had here. Tell me about the moment you knew you’d made it – that you were going to be successful – as a winemaker? You are never 100% sure. You know that the potential is there. There is always something that could not work out. But I knew we were going to be successful when … I started winning a lot of medals internationally. I knew when we started we could make better wines in this country, compared to what we had, using different grapes. With different grapes we could make better wines, but I didn’t know we could make such good wines. And today I’m convinced that we are as good as anyone else in the world. People in France at one time had the exclusivity. I would say, today, not anymore. They might have this wonderful reputation but sometimes when you compare product with product you see that they are not alone anymore. There are other people in the world who are producing (wines just) as good. When it comes to winemaking, what is your passion? My passion is to be on the scientific side part of it. It’s all know-how and putting it all together to produce either icewine or sparkling wine or red table wine. It’s to know that you’re using the very best methods and know-how to produce that particular wine. It’s not ‘oh, the guy’s an artist’ … no, that’s not good enough. You have to have more than being an artist. That’s the way I look at winemaking. It’s something that every year you get more passionate about because you acquire more knowledge and you never stop learning and studying, even at my age, you keep reading all the time and trying different things. It’s something that grabs you and doesn’t let you go. What do you want people to remember about your wines? I want people to remember that it’s genuine wine. It’s classic in every category. 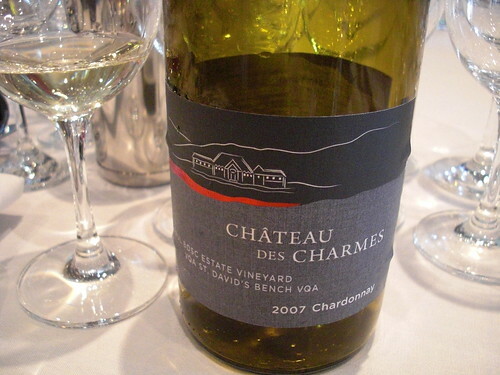 If it’s chardonnay, it’s distinctive chardonnay but typical chardonnay. Not chardonnay that doesn’t taste like chardonnay. I want to stay within the profile of the varietal. And if it’s a Bordeaux blend well, you know, what is a Bordeaux blend? It’s something that tastes like one of the best Bordeaux. It’s simple. I remember way back then, we were arguing at the (Vineland) research station about the style of wines and I remember one of the scientists there saying, ‘well, we were calling our wines Burgundy and Claret … what should a Burgundy wine taste like, afterall?’ I said, ‘afterall, if you call it Burgundy at least it should taste like a Burgundy.’ I wanted to make our wines in the classic style, what those wines should be. If you make a Bordeaux, it should taste like a Bordeaux. If you tell me my chardonnay tastes better than a chardonnay from one of the countries where chardonnay is produced, well, you’re not going to flatter me much. But if you tell me that it tastes like one of the best Burgundy chardonnays then I’m happy about it because that’s the way chardonnay should be. What are your hopes for the future of your winery, say 30 or 50 years down the road? My hope would be that we acquired international recognition like some of the great French estates. Already internationally we are known but my hope would be that when you talk about Chateau des Charmes 50 years from now you talk about it the same way you would talk about Chateau Palmer or any of those chateaux in France which have an international reputation. And I think it could be done here with our icewines, which are unique, so it could be done. But it took the French a lot more time than it took us to be where we are today. They are ahead of us by 200 or 300 years. Is there anyone in the wine industry — dead or alive — that you wish you could work with? Why? People like (Professor Jean) Ribereau-Gayon, the father of the new oenology, and his colleague, a great, great oenologist, Emile Peynaud. They have been, for me, an inspiration. As a matter of fact they have written beautiful books. That is where I acquired my scientific side. I work with their ideas because I always bought their books. Ribereau-Gayon was president of the university of Bordeaux, which was in his family for three generations. What do you do when you’re not making wine? Until very recently (a year ago at age 74) I was riding horses. And that’s pretty well it. When I was a kid what attracted me was grapes, trees and animals. At one time I wanted to become a veterinarian but I thought that was going to take me too long. I have five Egyptian Arabian horses. What are your thoughts on organic/biodynamic farming? We are partially organic and have always been the past 30 years. But, if my vineyards have some red mites, you’ve got to spray a miticide. There’s nothing else you can do to stop them from propagating. So, at that point I disagree. If you want to be 100% organic you’ve got to let it go. Taking care of a vineyard is just like taking care of an animal. You’ve got to make sure it’s in good health, make sure that it grows and does not suffer. So that’s why we are not trying to declare ourselves organic. I can’t have and mildew in my vineyards, I can’t have any red mites, I can’t have any berry moths. This affects the quality of the fruit so much that it is not something that I could accept. If somebody wants to do it that way, that’s fine. But, you know what, their vineyards aren’t going to last 30 years. Although we are 75% organic, I don’t want to try to be 100% because I don’t want my vineyards to suffer. I didn’t volunteer. I was conscripted. 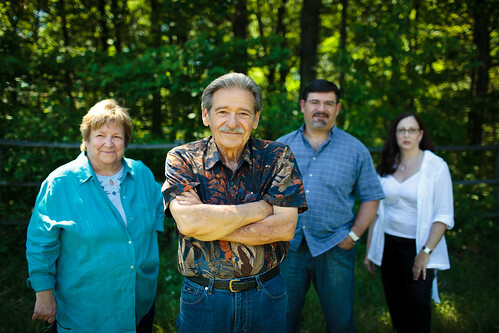 My dad bought his first farm when I was pretty young, 13 or 14 … and a few years later he started the winery. (His first farm was purchased in Lockport, N.Y. in the early 70s). We made every possible mistake you can make. We were doing it for the first time, planting varieties that no one had planted, figuring out vine densities, you name it. We did a lot of things right but we did a lot of things wrong. It turned out to be a tremendous learning experience. We were ready to pursue (winemaking) on a commercial scale. We purchased 60 acres that became our Creek Road farm. That (first farm in N.Y.) proved to a great outdoor laboratory. We learned an awful lot. He (Paul Sr.) was so far ahead of his time. What was your big break? Tell me about the moment you knew you’d made it – that you were going to be successful? I worked in the vineyards from an early age but that’s not where my dad needed me. He encouraged my interest in sales, marketing and business. Things he himself didn’t have a background in. I think now it’s encoded in our DNA. At least I know my dad has it, I have it. It’s what I call ‘the wolf’s at the door mentality’. And while what happened in Algeria, I was too young to personally experience it, but I’ve absorbed those stories heard over the years. Keep in mind that we lost everything. My birthright was taken away from me. That never leaves the back of your mind. You never feel completely secure. You can lose everything, even in North America. You are free to succeed and you are free to fail. For us, the wolf isn’t at the door, he’s in the room with us. So, even when you’re smelling the roses, it’s never far from the surface. We never take it for granted. That said, the answer to your question, I remember it vividly, it was almost 17 years ago now, the grand opening of the chateau, because it was very tangible, it was there, it was real. We had owned the land for 7 years and had slowly begun to nurture it, started to plant the vineyards … so it was a green field for a long time and, in the course of only a year, this sprang up and even at the time I was very conscience that not only was this important to our company and my family but I understood the significance of it for Niagara’s wine industry. The industry at the time was mired in recession like the economy was, the industry was spinning its wheels. A lot of people hadn’t transitioned into the free trade environment. That was all very, very new. I honestly believe this gave a boost to the industry. I like to think it had influence on some of our competitors who were already in the business and future competitors who weren’t in the business yet, who began to see ‘you know what, you can make a go of it’ in this industry. And the Boscs have shown how, whether it’s how to grow the grapes or to build a really great tourism program, which is a huge part of promoting wine. The cornerstone of your marketing strategy is to let people see your business, let them see how you grow your grapes, let them see how you make your wine. That was in 1994, our company was 16 years of age at the time. It took a long time, we really grinded it out, it never came easy, it still doesn’t come easy. We were just always persistent and never gave up. So, I could point to a calendar and say that’s when I felt we had made an enormous impact on the industry and hopefully a lasting impact. So far, so good. 17 years later, it’s still here, we’re still here, and it’s still an influential business within our industry. We punch well above our weight when it comes to innovation. Beyond the obvious answer of my parents, my wife Michele, we’re partners in this. We’re not only husband and wife. We work at the winery together. She’s a very bright woman. In terms of the wine industry, I’m influenced by other leaders in the industry. I’m always interested in the Mondavi family (Napa Valley). I see a lot of parallels with what started happening here in the late 70s, early 80s. It’s also a cautionary tale. But, by and large, I’m a big fan of what they’ve done and have visited the winery many times. I see international competitors like that as a bellwether. Things that they are doing today, challenges that they are going through, are coming to us. It’s just a matter of time. These issues will wash up on our beach. In the early years it was about delivering value. Before we talked about terroir or site specific we certainly knew what represented quality and what would represent good value to the consumer. That was a driving principal. Your wines are you children. We love them. But we have to be mindful that we are not the only ones enjoying our wines. So delivering on the proposition, being able to provide a reasonably priced bottle of wine and having them articulate that to you, that’s what really fuelled my passion. Eventually you start to evolve, and realize that Niagara has even greater potential than we even thought. 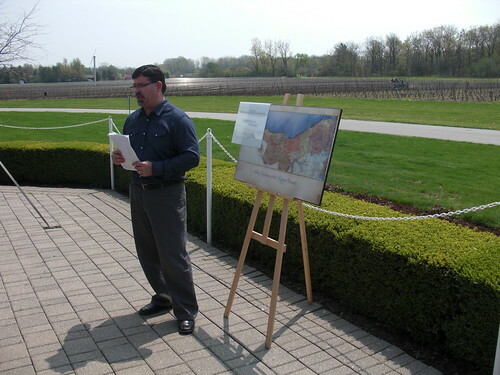 Wines that we (all of Niagara) are producing have exceeded even our own expectations. That got me thinking, how do we grow this thing. And the answer was literally under our feet. It’s all about the land. The land is the brand. A lot of our wines have single vineyard designation. I’m very interested in what vineyard that grows in and nurturing from it a wine that is a true expression of that specific vineyard. If you had to distill it down to a word it would typicity. This year is going to be our 33rd year in business, I do want people to learn a little bit about our history. It matters to me that people appreciate the fact that we’ve been doing this for a very long time. I want people to appreciate our wines, not just because they happened to like it at that moment but think about how it’s taken years to make this particular wine and was made by a family and its employees that have been doing this for a long time. It’s also important to me that whether they’ve bought a $15 bottle of wine or ours or Equuleus at $40 they say, you know what, that was worth every penny. It matters a lot to me that you deliver on the value. What are your hopes for the future of your winery, say 30 to 50 years down the road? I don’t think about that very much. My boy (Alex) is 3 and half years old. He believes in Santa Claus. It’s a very special time in my life. I became a dad relatively late in life at the age of 46 so it’s a very special time in my life and my wife’s. The little guy has a lot of years ahead before he needs to worry about the trials and tribulations that life’s going to throw him, just like what was thrown to me, you and everyone else. This is a decision that’s he’s going to have to make, so far down the road that I just don’t worry about it. I’m just enjoying being a dad. I don’t sweat too much about linking the long-term future of this winery with the Bosc family. To me, it’s far more important that the winery has a 50- or 100-year history still ahead of it and is employing people, contributing to the industry then to be still around in 50 years and still owned and managed by the Bosc family. Sometimes families run out of luck. What matters more to me is that the institution be preserved and move on. That passion need not come from the immediate members of your family. But I don’t think a lot about these things. I’m just too busy on a day-to-day basis. There are just too many day-to-day challenges. In order to be around in 20 or 30 years you’ve got to do well this year. I would have loved the opportunity to have worked Randall Grahm (founder of Bonny Doon Vineyard). I’m sure he’s had more than his fair share of trials and tribulations and he seems to have an awful lot of fun. Having fun has always mattered to me, too. I think I would have had fun learning from a guy like that. The guy is a heck of a lot more serious about the wine business than people realize. And very innovative. He’s a New World wine figure and he’s someone you can relate to. Something I’ve gotten back into is working out. It wasn’t all work as a kid, I was athletic as a kid and played a ton of sports. I’ve always been athletic. I got away from that in the last 10 years. I let my weight go way up, so I’m finding the time to take better care of myself but it’s really about health now. But there’s nothing, nothing I like doing more than being with my boy. That’s enormously important to me. And, I’m also a big reader and enjoy history. My passion for wine has not waned. I’m not a big collector because we drink pretty quickly what we buy. Some people accumulate a lot of wine because they don’t drink it. Not us. We buy it, hold on to it for a period of time, but then we drink it. That’s the way I want it. I don’t want to die some day with a big wine cellar. On that day I want the cellar to be gone. And maybe that’s where I’m found. If I were to punch my ticket, that might be it. What are your thoughts on organic/biodynamic? We approach viticulture not only as hard work but as science. So for us it’s difficult to buy the whole biodynamic story. It collides with our scientific understanding of what we do. I know there are a handful of people in the industry who are pursuing organic certification. For me, the jury is still very much still out on this. It comes down to agriculture and wine quality in particular. I’ve always given a lot of credibility to people who can prove something over a long period of time. If a new (organic) winery starts out and their first vintage is 2007 and the critics like their wine, good for them, but I don’t lose sleep yet over them. Let’s see if they can do it for 15 years at least. So those wines were good in 2007, all the wines in 2007 were good, let’s see how your 2008s and 2009s turn out. The weather threw you a lot more challenges. You’ve got to prove (organics) over a long period of time. Are those movements here to stay? I don’t think so. But it’s way too premature to declare that. Maybe we’ll revisit our views on it if in 10 years from now, this is something that is no longer on the fringe but has become mainstream. But to me, these are still highly unproven concepts and we need more time to assess it. But sustainable agriculture, by that definition, we’re huge promoters and have been from day one. We never use herbicides, we always return all the material, other than the juice itself, back to the vineyard, you know, the skins, the seeds, the stems. To be honest, my father finds it all a little amusing right now. It’s cool, it’s trendy, but few of us talk about it, we just do it. A lot of things that he’s been doing for a long tune has now become chic. Informative interview. I’d read some if the history in the “Niagara’s Wine Visionaries” book I just finished recently but it doesn’t capture the current story like this. And these two men are both treasure troves of information on what works in this region. Interestingly, I’m finding other wineries that have a similar approach to Org/BioD…it will require some time to see if the Org/BioD movements are sustainable practices for the long run. Thank-you for the comment, Shawn. And, yes, both father and son talk passionately about organic farming and don’t hold back on their thoughts. The overwhelming practice in Niagara is to farm sustainably but not if it means losing the crop. Some potential diseases in the vineyard are too risky to let nature take its course. On the bio end, you get a lot of raised eyebrows, as if it’s all voodoo science. There are a couple of believers but the vast majority just aren’t buying it.